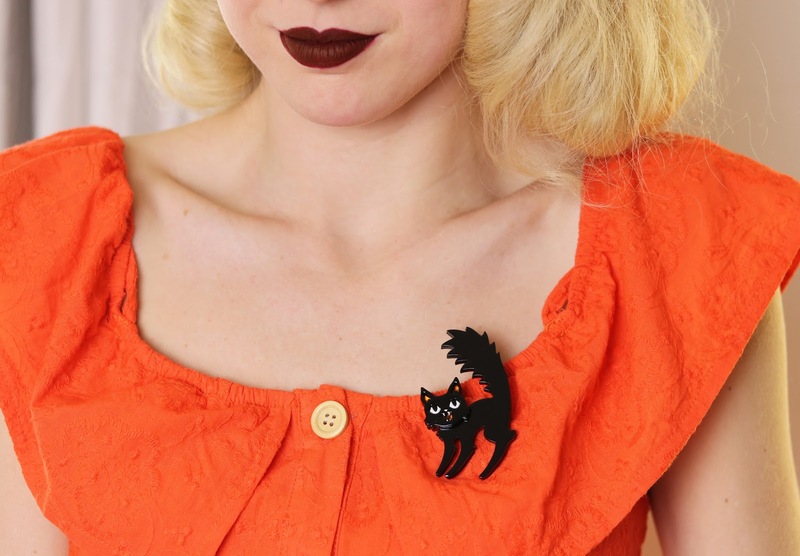 Erstwilder always has awesome cat themed Halloween designs and this brooch was just too good to pass up! 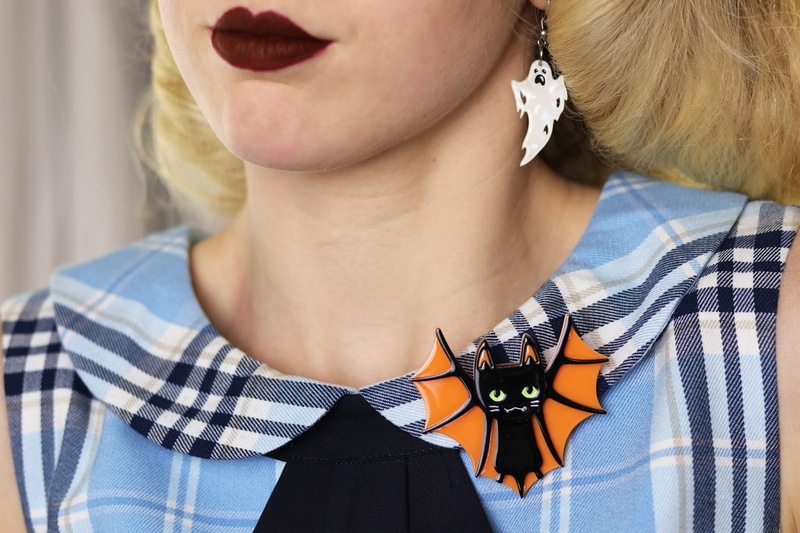 This hissing black cat definitely makes me think of Halloween but if you love cats and just really love the brooch I'm sure that you'll be planning to wear it all year round, just as I plan to! I love how this cutie pops on this orange dress and it really brings out the orange accents on the ears/mouth. These earrings are probably one of my most favourite designs from this collection, they just look awesome and make a real statement. I've been slowly adding more Erstwilder earrings to my collection and was so excited when I saw a preview for these. These earrings are lightweight to wear, I can style them with lots of different looks and they're oh so fun! I can't get over how awesome they look! I missed out on Bat Cat last Halloween and I am over the moon about it's return! The new orange recolour has also made me super happy because I love wearing orange. I loved styling it with this blue Hell Bunny dress and it's nice to know that these pieces can be worn with a variety of outfits/colours and not just darker looks for Halloween. Welcome to my collection Bat Cat! A beautifully detailed and sophisticated Halloween design. With pops of gold, red and yellow, the more you focus on this brooch the more you'll love the little details of this design. I love this brooch pinned to a simple white blouse and I can already imagine everything else that I would pin it to now that October is here! 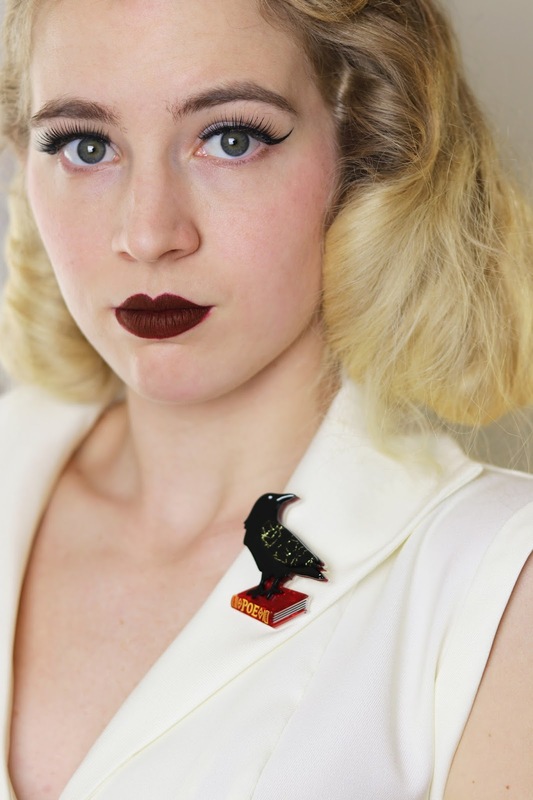 This brooch is so damn cute, a zombie pin-up? YES PLEASE! Again, Erstwilder wins with the beautiful colours and details, this is such a unique design and I instantly pinned her to a velvet top and added a bit of extra glamour with sheer vintage gloves. 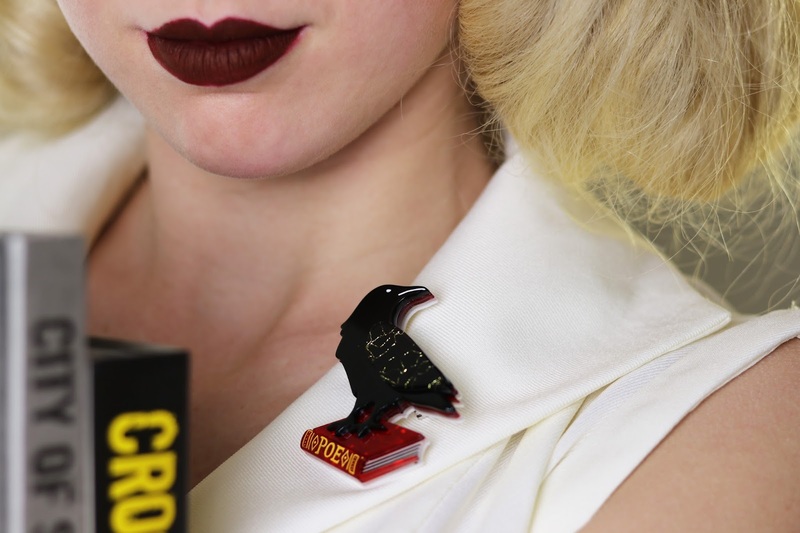 I think she's got a lot of personality and sass, this is just such a beautiful Halloween brooch and very true to Erstwilder designs. Halloween may not be huge in Australia but with designs like these I can incorporate a bit of spooky fun into my looks and even wear them all year round. This 14 piece collection has lots on offer, do you have a favourite?